More weight means more fun! We dictate the programming for the group classes, but there is a multitude of variations within that parameter you can explore. 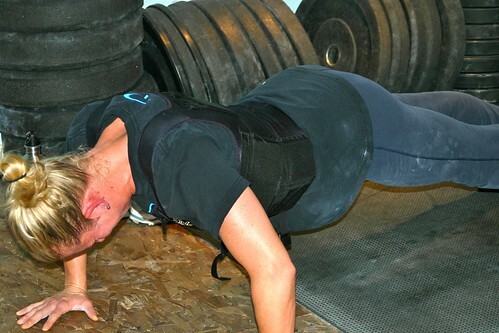 Above is an obvious example of how to make a bodyweight workout harder, wear a weight vest. Using dumbells instead of a barbell will also make a workout more difficult. Try using a different substitution than you normally use. For instance, the muscle ups for today have a variety of variations. Four pullups and four dips to sub for one muscle up will have a completely different feel than performing jumping muscle ups or muscle ups with an assistance band. The power output and metabolic demands can be manipulated by changing the prescribed weight. Perform push ups on rings, GHD sit ups instead of on the ground (be careful with this one), or go “chest to bar” for the pull ups.